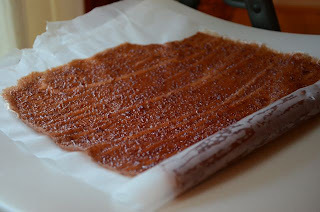 I always thought that making my own fruit leather sounded hard, especially since I don't own a dehydrator . But in my recent quest to try to cut down on some of the junk in our diet, I learned that it is actually a lot easier than you might think! Naturally bright and flavorful, your kids will never miss the red dye #40, buckets of sugar, and artificial flavorings! 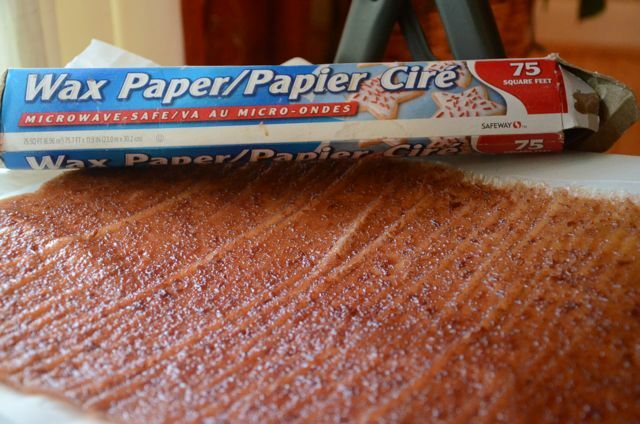 Makes about 16 two-inch wide fruit leather roll-ups. Combine all ingredients in a large saucepan and cook over medium-high heat for 5-7 minutes, or until mixture is juicy and most of the grape skins have fallen off. 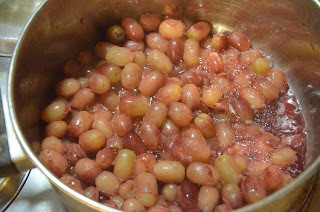 Remove from heat and allow mixture to cool for about 10 minutes. In a blender, blend until mixture is smooth. Pour 2 cups of the pureed mixture over a greased parchment paper lined cookie sheet (you'll grease the actual parchment paper) or you can use a Silpat if you have that (no need to grease the Silpat). You should have enough puree to make 2 batches. Refrigerate or freeze the unused puree until ready to bake. 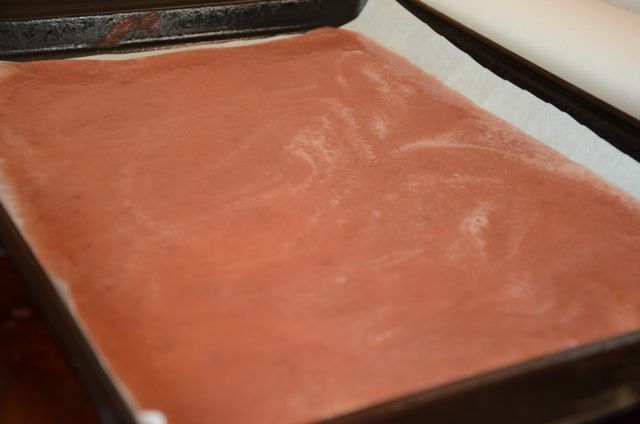 Heat oven to its lowest setting (about 150 degrees) and place the baking pan into the oven. Depending on how hot your oven is and how big your cookie sheet is, it will take 3-5 hours. I set the timer for 3 hours, then check it every 20-30 minutes after that. 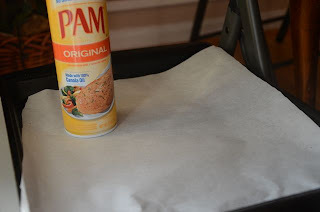 It will be done when there are no more sticky spots on the surface. Take care not to overbake it or it will be crispy and lose its flavor. 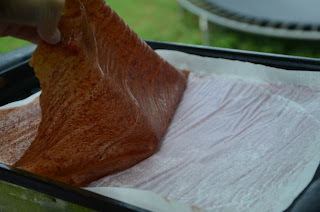 When the fruit leather is ready, remove from oven and allow to cool completely. 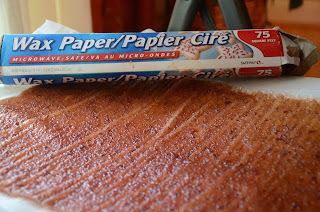 Gently peel away parchment paper/ Silpat and invert the leather in its entirety onto a sheet of wax paper. 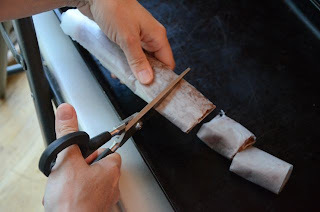 Using cooking shears or a pizza cutter, cut the leather into 2-inch wide strips (about 8). 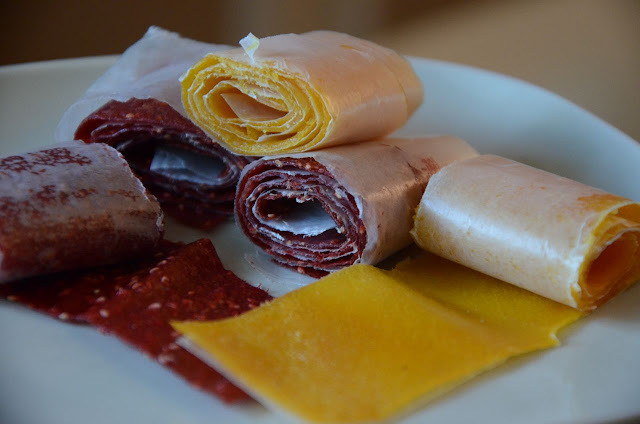 Roll and store at room temperature in an airtight container for about 2 weeks. Mango-Apricot (pictured above): 4 cups chopped mango (fresh or frozen), 1 cup dried apricots, 2 Tbs. 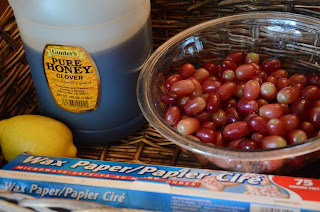 lemon juice, 1 Tbs. honey. Follow directions as listed above. 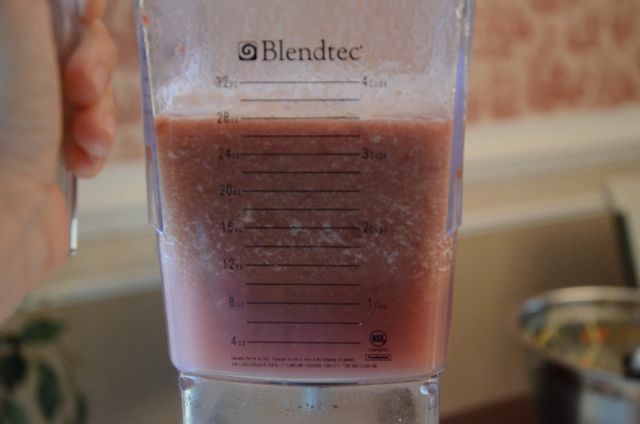 Raspberry-Peach: 2-1/2 cups sliced peaches (drained), 2 cups raspberries (fresh or frozen), 2 Tbs. lemon juice, 1 Tbs. honey. Follow directions as listed above. 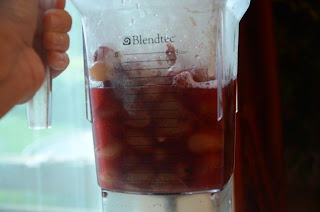 Blueberry: 5 cups blueberries (fresh or frozen), 2 Tbs. lemon juice, 1 Tbs. honey. Follow directions as listed above. Next I want to try pumpkin and apple for the fall! 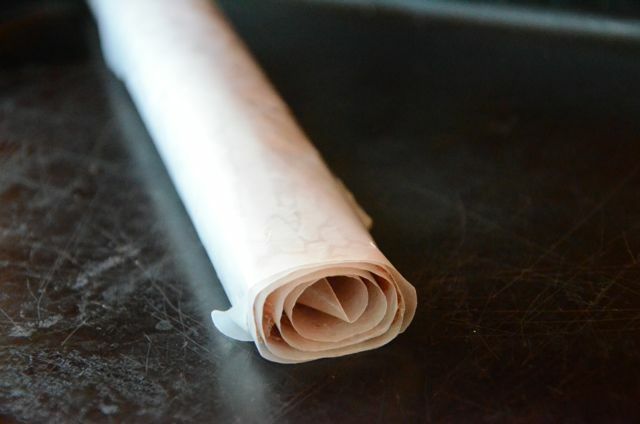 What a great idea to cut and roll it up in the parchment paper! Thanks for sharing! I never knew it was so easy! 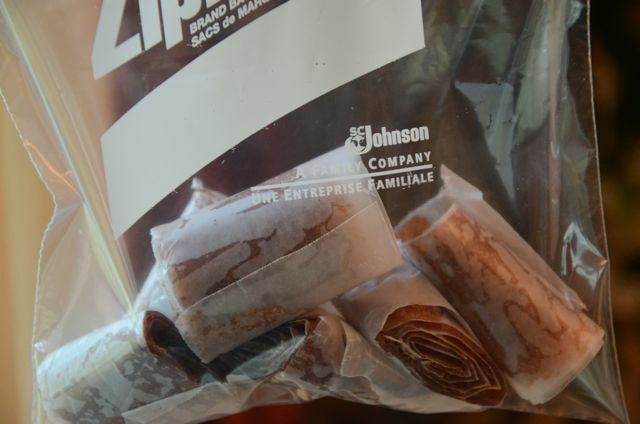 I will definitely have to try this because Lincoln LOVES fruit leather strips, and I don't feel too bad about the ingredients, but man are they expensive! We've got a box of peaches sitting on the counter. I will have to try the raspberry peach version. love love love! i have got to try this! Yum! I have been wanting to try this. Thanks for walking us through it and showing us how easy it is! That's it! That is simple. Awesome!!!! I like this idea! How would you recommend storing them? And have you tried freezing? I've never tried freezing them, but have good success with storing them in either a zipped plastic bag or a container with lid. They go fast in our house, so I've never had to worry about them lasting longer than a couple of weeks. 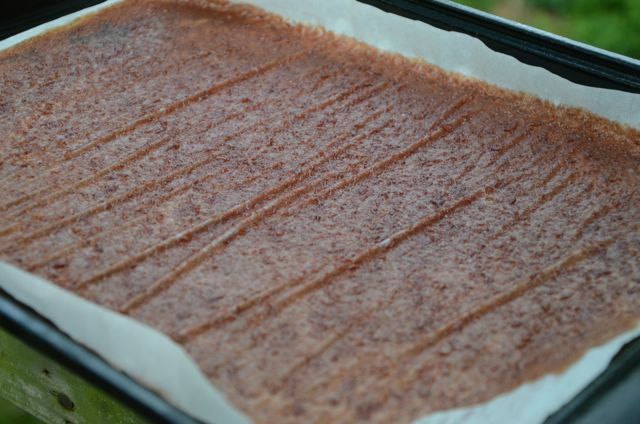 Next time I make them, I'll set some aside for freezing and see how that works.